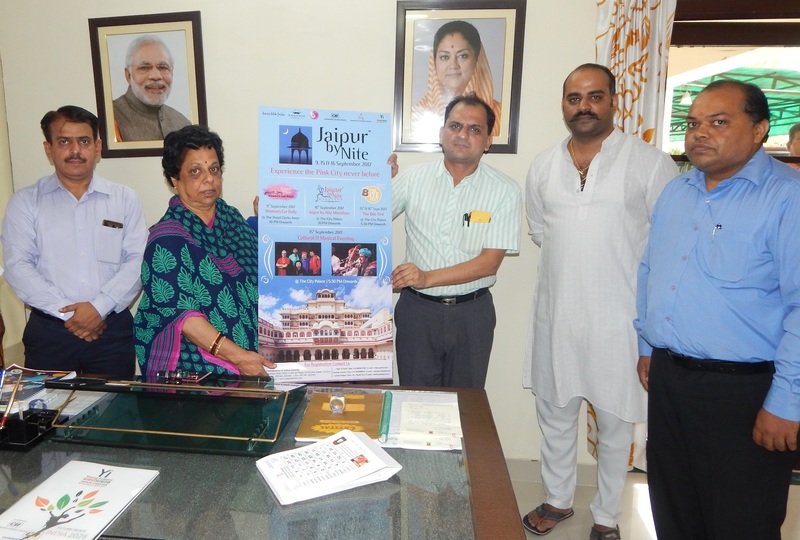 The ‘Jaipur by Nite’ poster was released on Tuesday evening by the Minister of State for Tourism, Smt Krishnendra Kaur (Deepa); Minister for Social Justice & Empowerment, Mr Arun Chaturvedi and Additional Chief Secretary, Tourism, Art & Culture, Forest, Environment & Mines & Geology, Government of Rajasthan, Mr Nihal Chand Goel. Also present on the occasion were the Chairman CII Rajasthan, Mr Basantt Khaitan and Director & State Head, CII Rajasthan, Mr. Nitin Gupta. On the occasion, Mr. Khaitan said that ambassadors and high commissioners of 12 countries already confirmed to participate at the Jaipur by Nite programme and more countries are likely to be confirmed. It is to be recalled that the 5th edition of ‘Jaipur By Nite’ festival will be held on 9, 15 and 16 September.The festival entails the Women Night Car Rally, Jaipur by Nite Marathon and the Bite Fest. The cultural festival is jointly organized by Confederation of Indian Industry (CII), Young Indians (YI) and the Department of Tourism (DOT), Government of Rajasthan. Rajasthan Khadi & Village Industries Board and the Department of Archaeology & Museums are also supporting the initiative. Its prime objective is to promote the Pink City as a tourism, craft and shopping destination.